Friday's A.M. Hot Clicks looks a fans who rocks at air guitar, a 7-foot, 440-pound lineman and features Nohemi Hermosillo as lovely lady of the day. ​Thursday was a busy night in sports. The Giants defeated the Redskins for their first victory. Odell Beckham Jr. introduced a new touchdown dance, and Madison Bumgarner and Joe West almost threw down. But this is Hot Clicks and we only pay attention to the really important stuff, such as this shirtless, hairy Memphis fan playing air guitar with his megaphone during the Tigers’ 53–46 win over Cincinnati . Meet John Krahn, a senior at King (Riverside) in California’s Inland Empire region and the nation's biggest high school football player. Can you guess which QB earned this rave review: "WHY IS THIS SO EXPENSIVE? It either words differently or is completely useless garbage, yet is costs as much as the other leading brands. Someone, please explain to me how this is worth what Amazon is charging?" My 40-minute commute home Thursday took almost two hours, thanks to Pope Francis' visit to NYC. I was not pleased, mostly because I had to pee like crazy and there was no bathroom nearby. On the bright side, at least I wasn't in the middle of a pro soccer game. SI spoke with CBS play-by-play man Ian Eagle before Week 1 to see how he prepares for a game. 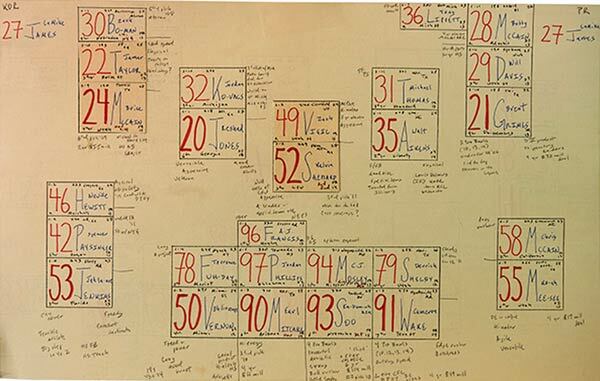 Here is his crib sheet, which, according to Eagle, "looks like something from John Nash in A Beautiful Mind." Click here for a zoomed-in version that highlights Eagle's Nash-ness. If Tim Lincecum is reading this and ever needs a housesitter, hit me up. Shout out to Hidekichi Miyazaki​, age 105, who set a Guinness World Record for being the world's oldest competitive sprinter ... A Washington fan attended Thursday night's game against the Giants in full redface ... A baby was born during Thursday night's Padres game at Petco Park ... Love this new court design of the Denver Nuggets ... David Ortiz was offered $100,000 to shoot an adult film ... Jerry Jones is not aging gracefully ... Doc Rivers vs. Mark Cuban is quickly becoming my favorite sports feud ... The internet's weirdest streaming live webcams (Panda Cam is my fave) ... Seven places Draft Kings and FanDuel have failed to advertise ... The eight craziest sports from around the world ... Eight rejection letters publishers sent to famous authors ... There will be a rare supermoon total lunar eclipse on Sunday ... The wealthiest inventors of all time. Sometimes you just need to tell your dad you love him. Are You Ready for the MLB Playoffs? If not, this MLB Network video should get you pumped. This is well done, especially Goldust. Big news! Corey Feldman's new song Remember 222 (Corey's Song) is No. 2 on the charts. The song is a tribute to Corey Haim and it's an artistic masterpiece. Since you asked, my favorite Corey Haim/Corey Feldman movie is Licensed to Drive, starring a young Heather Graham. I went to find a clip on YouTube and they have the whole damn movie. Enjoy! Mouse over a photo to get a pop-up view; click on a link to go to the gallery.